Bulk Barn just released a new printable coupon! Print this coupon to save $3 off your total purchase of $10 or more before taxes. 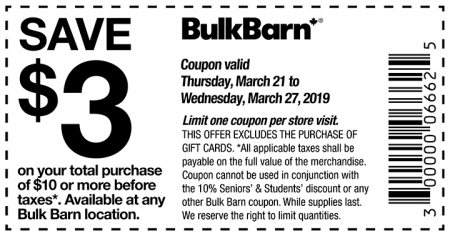 The coupons is valid at all Bulk Barn locations from Thursday, March 21 to Wednesday, March 27, 2019. There’s a limit of one coupon per customer during the promotional period. Also, check out Bulk Barn’s online flyer for more deals. Click here to print Bulk Barn’s $3 off coupon. Click here to find a Bulk Barn near you.